Let the fun be-gin! – Forest, Cuckstool Lane, Fence, Burnley, Lancashire. Home/The Forest/Let the fun be-gin! Forest at Fence formally launched its new gin still at a celebration evening on Thursday 20th September. Known as The Gin Spinner (all gin stills are given a name) and located in the main bar, the striking 30 litre still enables the batch production of large bottles (700ml), half bottles and miniatures. 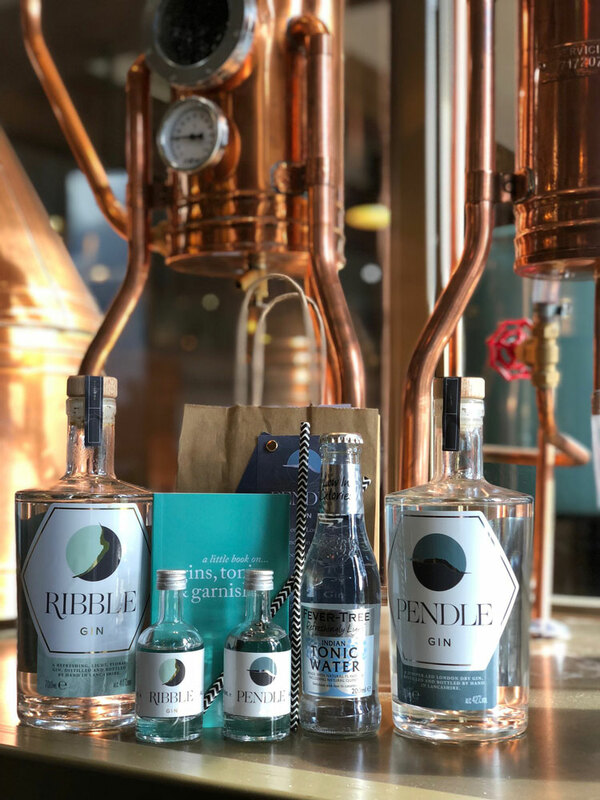 Moreover, two house gins – Pendle Gin and Ribble Gin – can now be enjoyed on-site, across all other Seafood Pub Company venues, taken home or given as a present. For an organisation renowned for its commitment to fresh, local and homemade produce, making gin in-house is a natural next step. The gins have been six months in the making and, quite literally, have a local flavour to them; many of the ingredients – including honeysuckle, elderflower and rose – are taken from the surrounding area. Pendle Gin, a 42% London Dry, has strong juniper flavours and an earthiness carried by angelica and liquorice root; it also provides a unique freshness combined from lemon peel, orange and coriander seed. It is best served with Fever-Tree Premium Tonic, grapefruit peel and juniper berries for a fabulous G&T experience. The Ribble Gin, a light, floral and refreshing offering, is particularly enjoyable with elderflower tonic, lemon and a rosebud garnish. defines us. We wanted to carry this through to our drinks offer and, although it has been a challenge, this is a very exciting development for us. Gin enthusiasts will be interested to learn that, as well as the Pendle and Ribble pours, The Gin Spinner will be producing limited runs of other flavours. Furthermore, with Christmas looming ever larger on the horizon, it will also be used in Christmas gift sets.